What is better proof that MP3 players are not just toys for adults but kids than to find a range of the device in Toys r Us stores? The list of MP3 products sold extends from Barbie MP3 and SanDisk Sansa Shaker to Walkmans and Zunes. 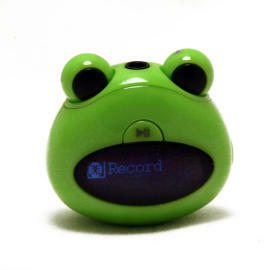 A tiny frog-like MP3 player, aptly called Ribbit, fits into the shelves in Toys r Us like any other cutesy toy. Its rounded shape and two froggy eyes sticking out at the top make the device simply irresistible. Measuring 1.5 inches by 1.27 inches by 0.93 inches, this amphibian is not only adorable but portable. It features an OLED display, 1 GB capacity, a voice recorder, playlist support, and eight EQ preset modes. The eight modes are Normal, Pop, Rock, Classical, Jazz, Bass, Soft, SRS WOW. It also supports seven languages including English, German, French, Spanish, Italian, Portuguese, and Chinese Simplified. At $25, Ribbit comes in pink, green, purple, blue or grey.